Are you looking for a driveway gate contractor that you can count on to always be there for you when you need them? Do you want a driveway gate company that will always answer the phone no matter what day or what time that it is? This would be our Gate Repair Santa Clarita. We have a 24 emergency repair service for our residential and commercial driveway gate customers. This means that whenever you call us we will send someone to help you right away. This is just one of the many reasons why we are considered the best driveway gate contractor around. Achieve optimal safety, security and convenience with our professional services which cover all types of gates irrespective of the brand, make or age. Count on our team of professionally trained technicians to provide the perfect repairs to any component of your malfunctioning electric system. We are experts in fixing steel panels, iron bars, tracks, chains, wheels, electric operators and remotes. All of our solutions are swift and effective. Expect top results no matter whether we provide emergency assistance or scheduled repair. Feel free to request our gate installation service for all kinds of projects which involve the setting up of a new system or a specific component. Our maintenance service produces top results in the short term and in the long term too. What kind of driveway gate contractor would we be if we did not have a gate repair and install service in Santa Clarita. Repair are a big part of our business. Some of the repairs that we can do for you are broken gate repairs, hinges welding, post repair, broken hinge repair, gate track repair, gate wheels repair and residential & commercial broken gate spring repair. We also do safety gate sensor repair install, exit loop installation and repair and install gate motor on existing gate. 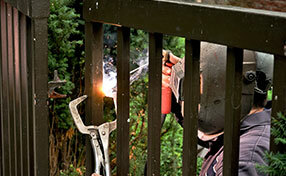 We have years of experience in iron work and can also do welding services. 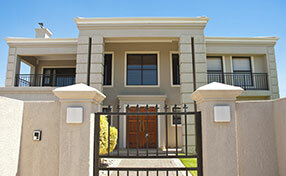 We can also make Window Guards, Security Doors, Guards & Railings, cages and much more. Call our driveway gate contractor in Santa Clarita and tell us that you want a wrought iron fence. Let us talk a little more about custom made fences in Santa Clarita. We can custom make any kind of fence or gate that you would like. We can do overhead gates, swing gates, sliding gates, wrought iron gates, iron gates custom made pedestrian gates, walk throw gates, driveway gates, parking garage gates, electric gates, automatic driveway gates and barrier arm gates. These will all be customized exactly how you want them to look from the height to the width and even the color that you want them. Our Gate Repair Santa Clarita does all kinds of services and one is with driveway gate openers. We can come out and supply and install a opener for you in no time at all. These are top brand openers like Elite, Doorking, Ramset, GTO Pro, Eagle, FAAC and All O Matic. We also have MULTICODE, Linear, Reno and Viking. We can also repair or replace any of these driveway gate openers that you may already have. Driveway gate openers can make life a lot easier for any commercial or residential person who has a gate on thier driveway. We at our driveway gate contractor in Santa Clarita also has a phone entry systems-intercoms service. This service will have us install and repair either a keypads telephone entry systems, phone gate systems, residential & commercial residential Entry Systems. We have a commercial entry systems ELITE, DOORKING, LINEAR programming service. 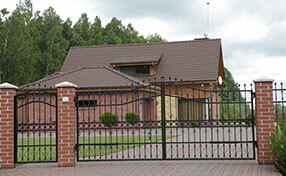 When you are looking for a driveway gate contractor in Santa Clarita you want one that is Licensed bonded and insured. This shows that they are a reputable company. We are one of these companies. We are a professional service gate service and always does quality work. Check out our contact information. We hope to hear from you soon. All overhead gates use springs whose job is to counterbalance their weight and to facilitate movement through the release of force. The gates with single panel design have two springs. There is one on each side. The sectional and roll up systems have a single torsion spring set above them over a metal shaft. There is a need for overhead gate spring replacement when this component gets broken. Otherwise, the system will not operate. Severely worn and damaged springs are also replaced. The same applies to one whose size does not match the weight of the gate. The replacement process involves the removal of the old component and the installation of a new one. After the new spring is set into place, it is adjusted and lubricated. Lubricant is applied to all coils for smooth operation and reduced rate of wear and tear.